We all love having out pets around with us. They are great companions, serving different purposes in different homes. Now, imagine your pet getting an injury. It’s an injury that limits its movements, preventing it from reaching certain places it easily could. How would you help your pet in such a situation? There are many answers to this question but one solution is getting yourself a pet ramp. These are products meant to support pets that are aging or have developed a limitation that prevents it from getting to raised surfaces. This could be on the bed, on a chair or in your car. How do you know which are the best pet ramps? Well, the first thing you’ll be looking at is portability. The ramp must be able to fold or retract to an easy to carry size. It should be able to fit in your car or even under your bed. The ramp you want must also be lightweight. However, the weight shouldn’t compromise on strength. What you’re looking for is a ramp that’s built of materials like aluminum combined with plastic or even fiberglass. These are strong materials that are light as well. And with the strength comes the weight it can support. Find out the maximum weight the ramp can support so that you choose the perfect one for your dog. Some are able to hold pets of above 400 pounds while others can only handle 150 pounds. Safety is also key. The walking surface of the ramp needs to be made of a high-traction material that is also comfortable to the touch. You don’t want your pet sliding off it as it climbs, especially on steep inclines. Okay, let’s check out the best pet ramps available. We’ve compiled a list of five of the best that you can find. Read on to find out. We begin our search for the best dog ramp with the Solvit Deluxe. And as its name suggests, this is a deluxe product for your dog. To give your pet an easy climb, the Deluxe is built with strength and durability in mind. Made of a combination of aluminum and plastic, the Solvit is bound to serve your dog for years without showing signs of stress or strain. But to enhance portability, its aluminum build also gives it a lightweight quality that’s perfect for a ramp. You’re most probably going to be moving the ramp around and so it being just 13 pounds is a positive feature. However, this belies the fact that the ramp can easily support weights above 400 pounds making it great for dogs of all sizes. Easing the climb is a textured surface which provides the dog with a firm grip while climbing. So there will be no chances of sliding and injuries to your furry friend. This non-slip tread is especially handy where there’s a steep climb. The Solvit, being an adjustable size from 39 inches to 72 inches, allows one to use it for various heights. The maximum height the ramp can be used on is a staggering 36 inches. Pet Gear bring to us this amazing pet ramp, the Tri-Fold. And the name gives away its spectacular design. It’s a design which folds the ramp three times, making it compact enough to tuck in your car or wherever else you please. When folded, the ramp reveals a handle which enhances portability. And with a lightweight feature, weighing only 14 pounds, you’ll find it effortless to carry around. If you’re worried that the folding process is an arduous affair then worry no more. Setting up is super easy, a task of just a few short minutes. This makes it ideal for to get your pet in the car, on the bed or any raised surface. The surface of the Pet Gear Tri-Fold is textured to provide your pet with a firm grip. This texturing gives the ramp the capacity to help your dog climb even the steepest inclines without posing a risk of falling off. Also, the sides of the ramp are raised to ensure the dog doesn’t fall off the edges. 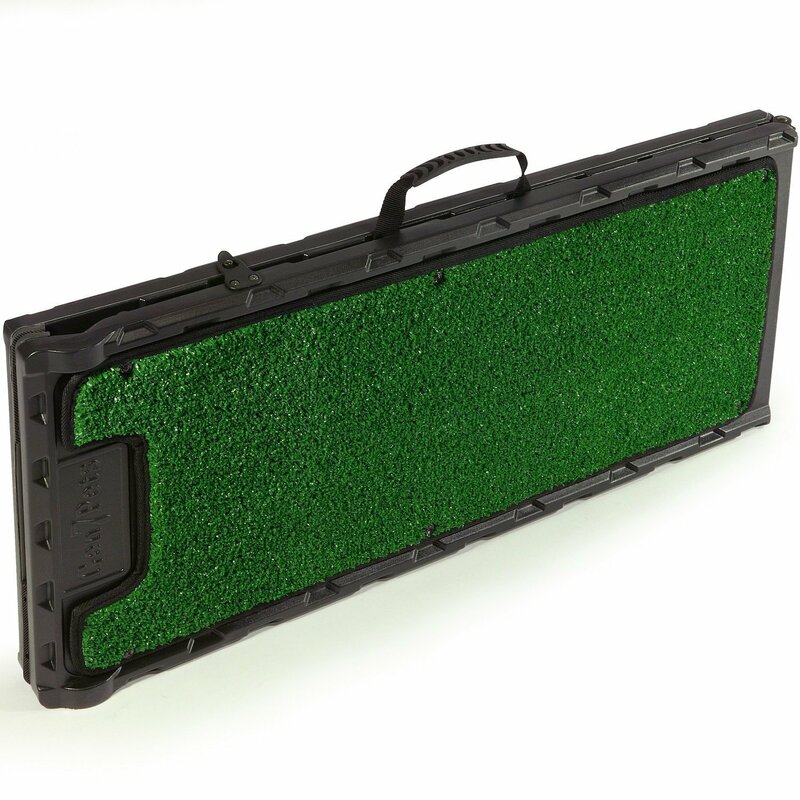 And with the rubberized bottom grippers, the Pet Gear Ramp will remain firmly rooted on the ground. This ensemble makes it perfect for small, medium and large dogs. If you have cats, you can use it as well. The maximum weight that it can hold is 200 pounds. Solvit return with another pet ramp. Just like its sibling, this one is built with the pet in mind. To help your furry friend get to high places, Solvit has it covered. This ramp is made of plastic. The build, first of all, gives the ramp a simple, lightweight construction which makes it easy to set up. Portability is also enhanced by the fact that it can be folded right down the middle and because of the safety latch, an accidental opening is prevented. 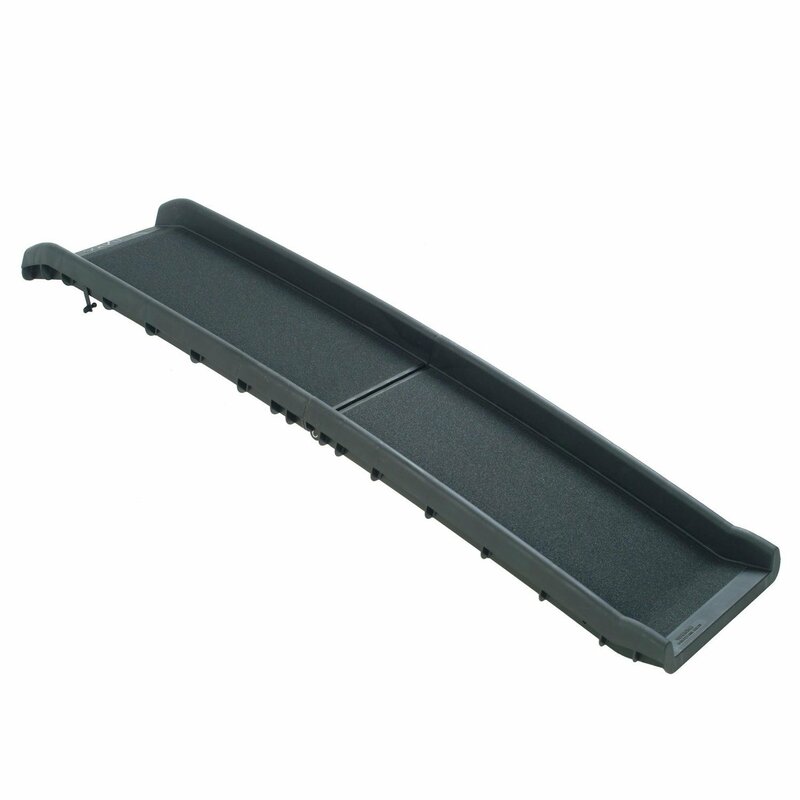 However, the plastic construction also gives the ramp a rugged quality, making it strong and highly durable. The Solvit ramp, therefore, has the capacity to support dogs of over 200 pounds. At the bottom, the Solvit has four rubber feet. These ensure that the ramp remains planted on the ground when in use. Still, another safety feature is the textured walking surface. Your dog’s traction is increased because of this and therefore chances of slipping are totally eliminated. Because of this, your pets are able to reach heights of up to 24 inches and at steep inclines. And with the one year warranty against material defects, Solvit give us an assurance that this ramp is built to last. Pet Step, another pet ramp manufacturing company shows us that there isn’t a shortage of great ramps in the market. And with stiff competition coming from the products reviewed above, Pet Step argues its case with eloquence. This pet ramp is great for aged or injured dogs, aiding them to get to raised places safely. It’s made of a combination of plastic and fiberglass. This ensemble grants the ramp a highly durable feature that withstands stress. Still, the materials keep the weight of the ramp down, only weighing in at 18.5 pounds. 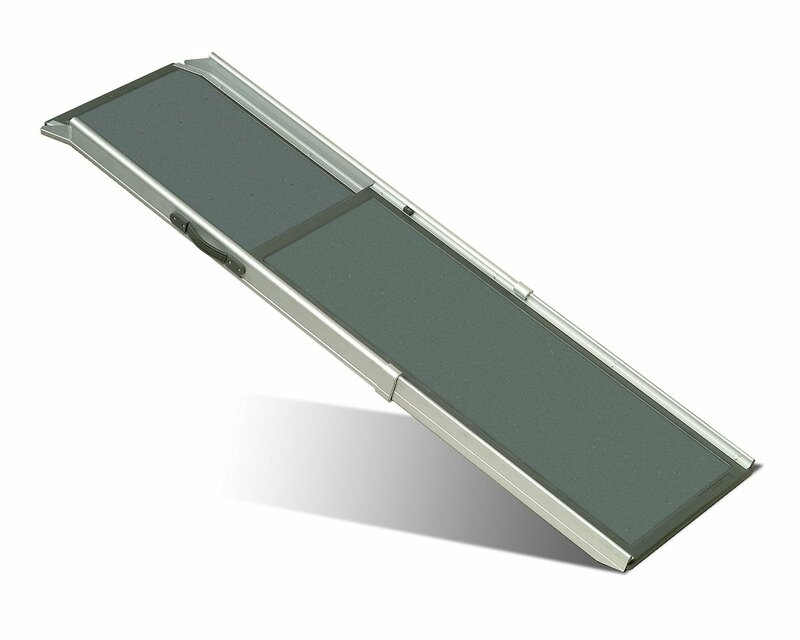 Since it’s able to effortlessly fold right down the middle and with its cut out handles, transportation of the Pet Step is a painless process. The surface of the ramp is lined with a soft, non-slip ridged rubber. This is not only comfortable to the dog but also ensures that your pet’s traction is maintained in both wet and dry situations. At each end, there are heavy duty rubber grips which ensure that the ramp is kept firmly in place when in use. Pet Step takes our confidence in their product even further with their five-year warranty. With such an offering, we’re certain this product will last. If you’re looking for something more unique then the Gen 7 Pets is meant for you. They seek to stand out from the other pet ramps by offering us a product that’s different from the rest. And this is a good thing because it takes its place in our review of the best pet ramps. So, first things first, the Gen 7 Pet is called a natural step because the walking surface artificial turf. This gives it a beautiful, natural look and a soft, comfortable feel. 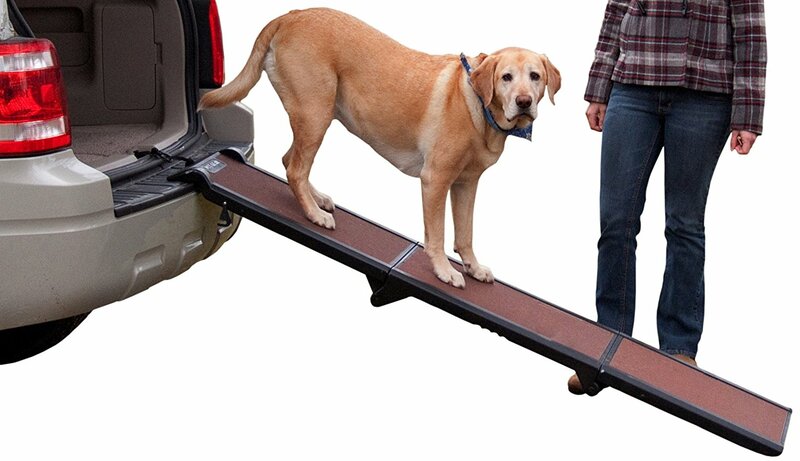 However, it also ensures that your pet has a firm grip while climbing up or down the ramp. Portability is also another important feature and Gen 7 Pets didn’t leave this out. The ramp easily folds right down the middle, locking in place to prevent accidental opening. When folded, it measures in at just 36 inches in length, 16 inches in width and a thickness of only 3 inches. With such dimensions, the ramp can fit wherever you want it to. Still, its lightweight feature is a sharp contrast to its strength and durability. The ramp can support pets of up to 250 pounds in weight making it ideal for pets of varied sizes. There you have it, our list of five of the best pet ramps you can find. This list isn’t exhaustive but is a great place to start if you’re looking for a strong and portable ramp. The race was a tight one. All the above have proven to be excellent products from excellent manufacturers. However, the one that edges past the rest is the Solvit Deluxe Telescoping Dog Ramp. It is highly portable due to its tri-fold feature. It’s made of a combination of aluminum and plastic, offering it strength and durability. The Solvit Deluxe is still lightweight despite its strength. And, of course, it can support pets of up to a whopping 400 pounds. 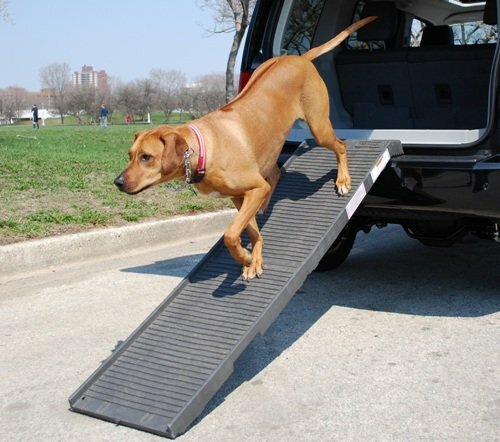 The Solvit Deluxe ramp takes the title of the best pet ramp.